But it’s soo tempting. Surely it can’t be that bad. I know lots of people that eat that very same fruit or at least something similar. Laralee gazed longingly at the tree just a few steps off the woodland trail that she frequently traveled. With a sigh she turned away and marched onward, but a little imp that she couldn’t see but was often her companion hopped on her shoulder. “I saw Ricky nibbling on that exact fruit just the other day, and he seemed to be enjoying it. Besides Penny-kay indulges in a similar type daily, in fact she has gone on to ‘stronger’ kinds. Even though Laralee’s face clouded over at the thought of Penny-kay who had seemed pale and wane the last while, her feet lagged. Laralee turned back. Ahh, there was a delectable looking achene just out of her reach. She stood on her tiptoes and leaned forward, Who would have ever guessed there were so many thorns on that attractive looking bush? She snagged the one of her choice and backed off to enjoy it. It was good, excellent actually, and she found herself craving more and more. Finally feeling drunken with her new pleasure she staggered away and only then noticed the sun was low in the sky. “Why are your arms so scratched up?” her mother immediately asked when she stumbled drowsily through their own front door an hour later. Mother grabbed her arm and looked at it closely. “Ya?” Laralee stifled another yawn. Laralee nodded vaguely and tried to inch away, but Mother placed a hand on her shoulder. “The fruit you ate today isn’t immediately life-threatening, but don’t let that fool you. The more innocent seeming kinds have been planted by the Evil One closest to the path but they quickly lose their appeal so that wanderers will be enticed further into the Enchanted Woods. The deeper one goes the more entangled they become until the wicked ruler of those grounds convinces them they are hopelessly lost or that his fruit is actually better than what the Lord God provides. Laralee’s eyes drifted shut. “Okay, Mom, I’ll be careful.” She didn’t know that it was the enemy that was making her so sleepy and unaware of the dangers she was being tempted with. Will she be careful? Will you and I? Will we listen careful to the Lord God and stay away from those temptations that the Holy Spirit warns us against? 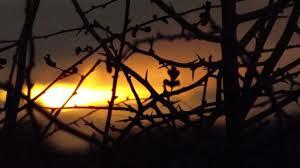 Sooner or later the thorns wouldn’t bother as much if we allow ourselves to become used to the forbidden fruit. But it won’t be worth it.